Michiana Fish Services has highly skilled aquarium designers who listen to client's requests of aquarium design for inside home aquariums, fresh water or salt water aquariums, business office aquariums, or outside aquariums. Our designers use customized construction methods for designing and creating the highest quality and most uniquely designed aquariums. We pay close attention to client's needs by listening and observing. We offer consultations to determine the client's aquarium needs. If you have been searching for an aquarium that can be customized and built to suit your style, then you are in the right place. We can offer design consultations online, by phone, or in person. You may visit our site to view some of our amazing and unique designs we have created for clients. We offer very reasonable prices along with a complete guarantee. All payments accepted are safe and secure and we never share info with other companies. Our company specializes in Aquascaping which is the art and science of planning the layout of aquariums. We offer endless possibilities. Dutch style, Biotype, and Theme tank designs can be created for you. We can be your starting point for your design ideas. Our company has licensed aquascapers that can create realistic designs for aquariums. Natural color finishes can be used and they never fade. We can create a pond-less waterfall for your outdoor landscape. We can create premier water feature designs. An aqua garden can complete your outdoor oasis. Michiana Fish Services strives in delivering excellence for all of our clients. We use the highest quality aquarium building,sand designing materials that will deliver you lifetime use. You should contact us today by filling out our short form to request more info. We love to welcome new clients. Aquariums can be created and designed for any room of the home or office. We are committed to high quality work. Our company has received five-star ratings for our beautiful aquarium designs. We can use cave-work, stones, gravel, driftwood and rocks to complete interior designs. Choose from Japanese styles, jungle styles, saltwater reefs sand more. 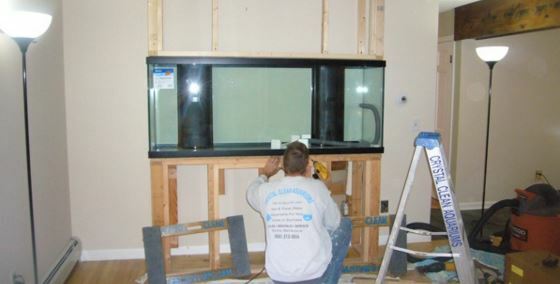 Designing your aquarium does not have to be a complicated job when you ask for our help. We are the experts in aquascaping. Thank you visiting our website today and we are waiting for you to contact us so you can get a good head start on designing your aquarium and making a great place for your sea creatures to live. Add attractiveness to your home or office. Family and friends will really love your new aquarium.